Before anyone points it out, yes I know this film is more of a sci-fi feature than Horror. Despite this the film does feature Horror elements, not in your gore or slash style but more of the Horror/thriller dimension and this certainly helps the tone of the film. The film was directed by none other than legendary b-movie maker himself, Roger Corman. His name alone tells you what you should expect from the feature. 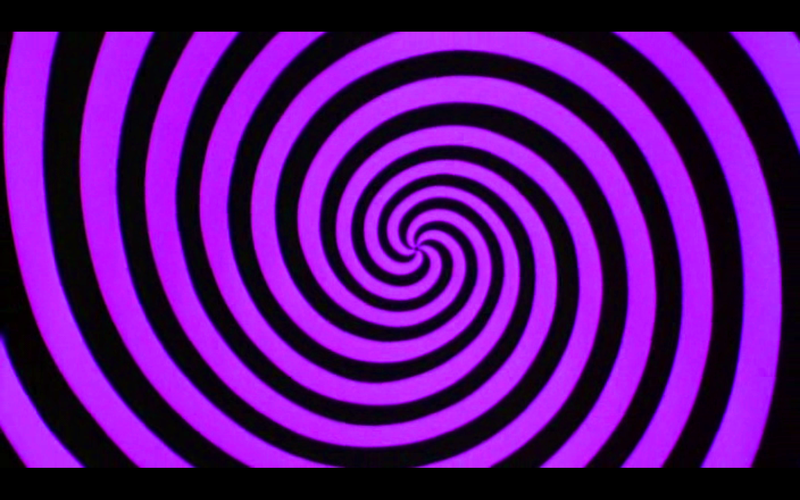 Some people have stated over the years that the film was a parable for LSD or even just addiction in general and it wasn't unlike Corman to put these aspects in his film. 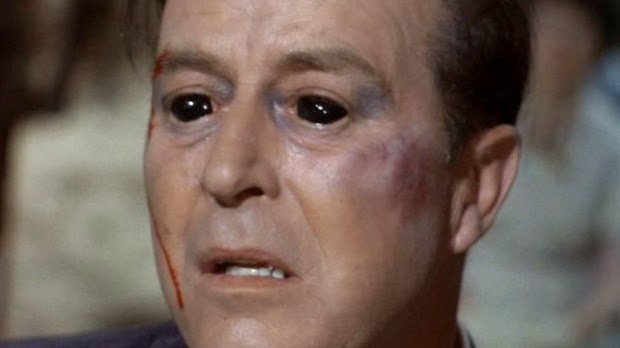 Lead actor Ray Milland is fantastic as 'Dr. James Xavier', it's a captivating performance. One that made me forget about ever wanting to have X-ray vision. 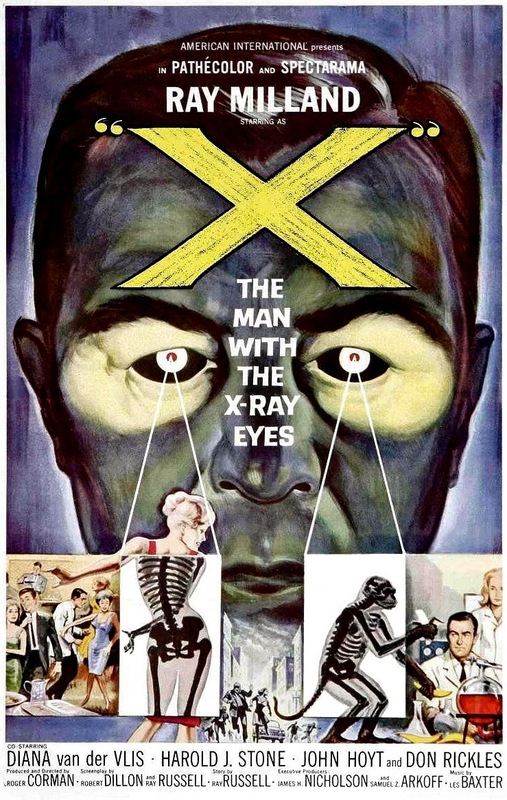 "X: The Man With The X-Ray Eyes" is a Corman classic, perfect sunday afternoon viewing. It has long been rumored that a final scene, in which Dr. Xavier screams "I can still see!" was cut by censors. No footage of this is known to exist. However, the movie does end rather abruptly just as Dr. Xavier seems about to say something, and those words would provide a chilling climax to the story. This rumor is false, according to director Roger Corman. In a Q&A session he said this idea was discussed but never filmed. To create the effect of being able to see through a building, the director filmed the construction of the building in time lapse, then ran the film backward. This film originally had a five minute prologue about the human senses. This prologue was removed from all post-theatrical prints of the film, and may have been removed from some of the theatrical release prints. This reduced the running time to 79 minutes. The footage still exists. Final film of veteran character actor Morris Ankrum. The final chase scene involving Ray Milland's erratic driving took place on Soledad Canyon Road between the cities of Santa Clarita and Acton in California, the same place where nearly the entire film "Duel", (1971) was filmed. The skeletal building seen repeatedly from Dr. Xavier's point of view (in "Spectrarama")was the Department of Water & Power General Office Building in Downtown Los Angeles. Construction had begun around 1963 and completed in 1965.